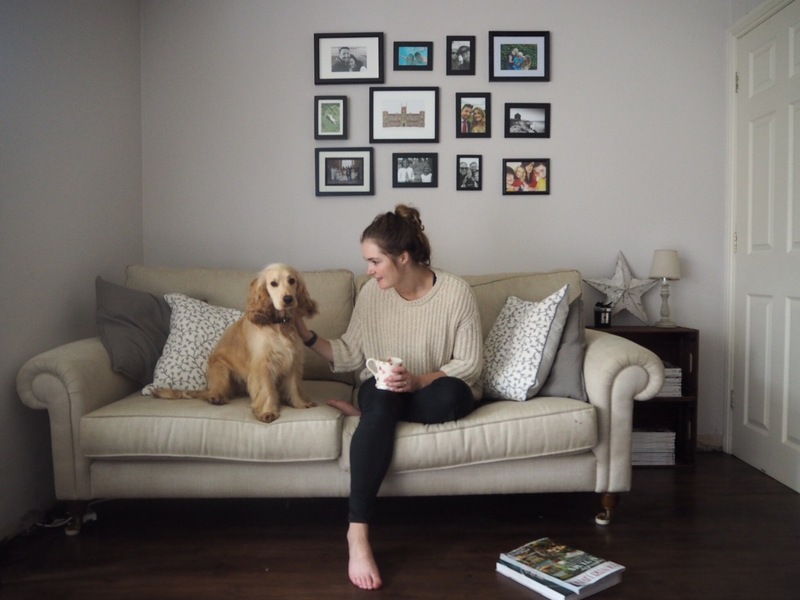 It was never my intention to do a complete living room renovation so quickly after we got the kitchen done but when we were off work I seen no better time than to make the most of it and get some stuff done. It all started with the wooden floor. Last year when we got Piper, everyday when we came home, our cream carpet was scattered with muddy paw prints. It was time for that to change. I thought a wooden floor would be the best option for use. 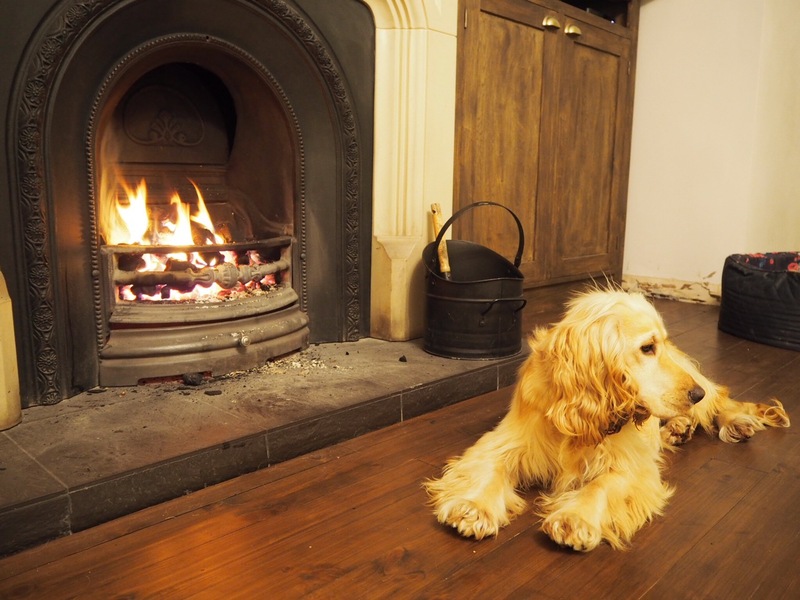 I just love wooden floors and I sold it to Chris that it would be super quick to clean up after the dog. Dad got the plain wood for us and Chris and him laid it over 2 days throughout the living room and hall way. I was so pleased that they did it together and so quickly. I wanted a reclaimed wooden floor but honestly we couldn’t justify the price of it. 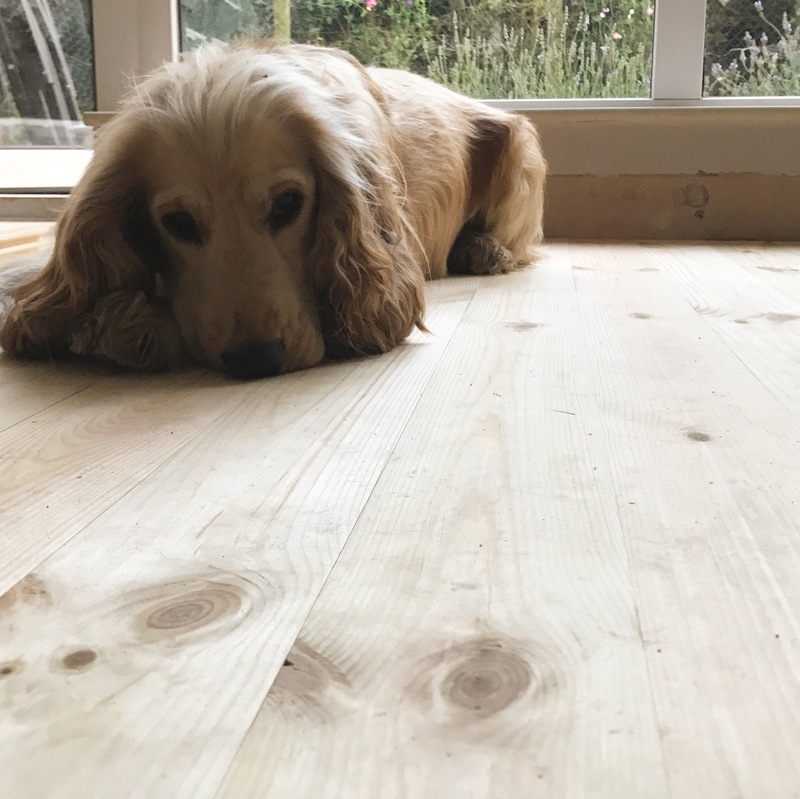 At almost double the price of what we paid for our plain wooden floor boards and considering we would have to do significantly more work to prepare the wood before we could even lay it. So I established I wanted long boards with lots of knots in them as we were going to stain the wood dark. Dad bought the wood from a wood merchant in his local town which had the tongue and groove already in it. 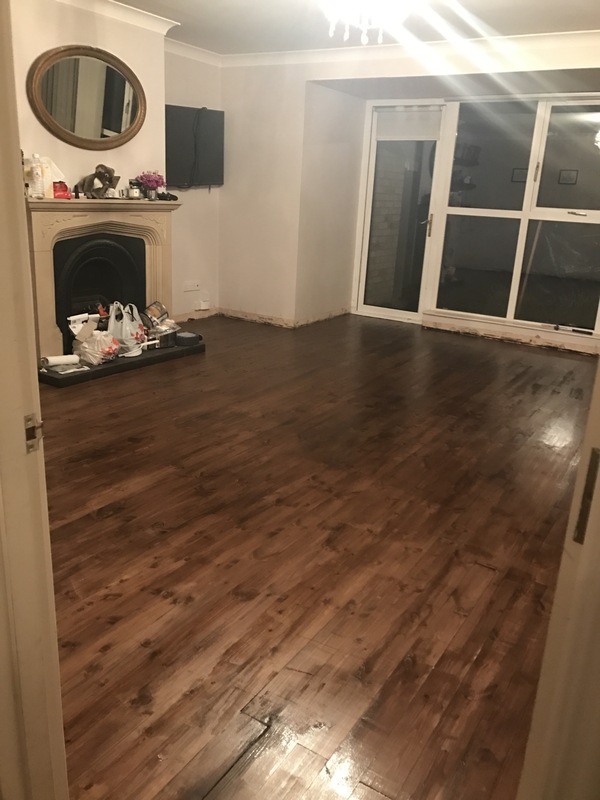 We went for a redwood pine, is a lower cost wooden floor but it’s a soft wood, although redwood is a harder version of pine, so high heels can mark it easily so it has to be treated to reduce the amount of marks on it. I love the marks on the wood it makes it look distressed and older than it actually is. Although the wood was sanded, there were knots throughout it with made it, exactly what I wanted. It all started with a day of preparation. We began removing the tiles for the hallway and the carpet from living room as well as packing away as much furniture that we could. Removing the tiles was so difficult, and when we were disposing of them, they were bloody heavy! We then had to remove the skirting boards, they were cheap chipboard so they came apart when we removed them we just through them away although if you have real wood treat them carefully. Once everything was removed and cleared the floor could be started the next day. I have to confuse dad has done this before so isn’t completely a novice, Chris on the other hand is new to this so he watched a few YouTube videos to get himself up to speed and with dads experience he caught on to it in no time. Thankfully I have to say, both dad and Chris are measure twice, cut once guys so I left them to it. They glued and nailed the wooden boards to our concrete floor until it was completely covered. Unfortunately for the next two days, every lady who entered the house for eyelashes was greeted with a saw dust haze at the front door. Over the next two days while I was busy lashing, I could hear the chatter between the two of them, working hard to get the job done quickly, renovating a room is hard because you live without that room until it is finished, harder still for us in a tiny house where most of the furniture was then placed in the kitchen which we had to manoeuvre around. After two days the floor had been laid but the hard work wasn’t over yet. Now to move on to the varnishing. I wanted a dark oak colour, cooler tone than the more popular mahogany teakwood. I journeyed to B&Q to have a look. I picked the colour immediately, I knew exactly what I wanted. While I was there I noticed that there was a new range of ronseal which had a simple varnish pad which claimed to be 5 times faster than a regular application with a normal brush. The problem was that the colour I wanted wasn’t available in this range. I decided to see what I could do about it. I asked one of the painting experts in B&Q who was so helpful and said that it was just the regular ronseal with a new brush included and essentially had a marked up price. She directed me to a a similar sponge brush and I bought it straight away, now to give it a go. When the floor was complete it was time to prepare it for the varnish. I picked a matt varnish as I don’t like the look of a gloss finish but the best thing about real wood is if you don’t like it you can sand it down and paint it again. We sanded the floor, ever so slightly, hoovered and rubbed white spirit it to remove all of the dust. I then got started with the varnishing with my crafty new mop type brush. I have to admit I’m the beginning I was a little slow. I realised that although it was faster I had to go around the door frames with a small brush. Once this was done, I was quicker. The only problem was moving around the rooms, because our front and back door was being varnished we had to leave some things out the back of the house so we could leave for a few hours and let the floor dry. Our neighbours must have thought we were crazy getting changed in our back garden, hopefully none of them saw! After 6 hours we came back and we were ready for another coat with another brush so this time, two of us would tackle it. 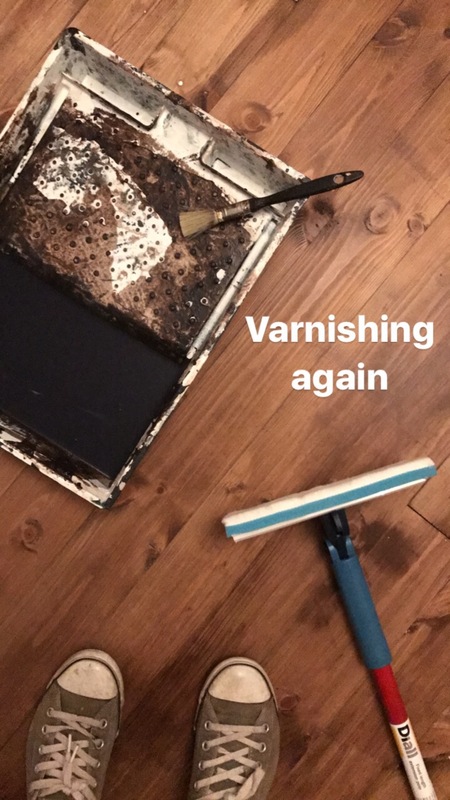 The brush was so much quicker this time but we worked in the opposite direction, from back door to front door meaning this time we locked ourselves upstairs, while I put the finishing touches to the hall, Chris heated up dinner and took it upstairs, the glamorous life of renovating. That way we could leave it over night to dry, ready to evaluate in the morning. I was happy with it then but Chris thought another coat would be good, don’t tell him, but he was right. We added another coat and then headed out for a walk, thankfully we ran into some friends who invited us for dinner so we had an even better excuse to be out of the house for the next 6 hours. When we arrived home we ran quickly upstairs, nothing is more nerve wracking than the first step on a varnished floor. We came down in the morning and it was done. I’m still so delighted how it turned out. Furniture back in for now until the wood burning stove. Once the room was empty we used the opportunity to rearrange the furniture. Again Chris’ idea and again he was right. The room looks much bigger now and we are really using the space better. Just waiting for the Laura Ashley sale to pick up a new sofa…can I even wait that long! The wooden floor has helped with the muddy paws for Piper but now I see her fur more than ever…is there ever a perfect solution. I’m trying to convince Chris that a cordless Dyson would be a good idea, he’s not buying it…yet. Next stop wood burning stove.